When I was at the grocery store I saw something new. They were “long peppers” and they looked very tasty. I tried one raw and it was very good and really sweet. They are perfect for snacking or in a salad. I had been meaning to try roasting my own peppers for a while and this was the perfect opportunity. And so I made roasted red pepper pesto. 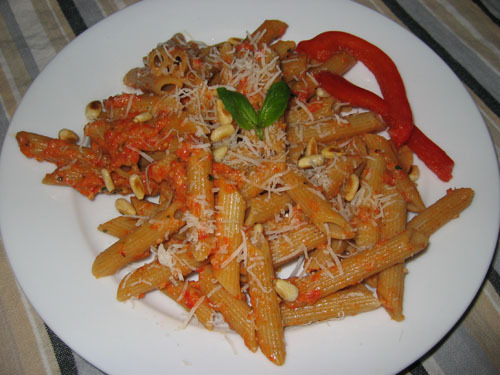 Serve on penne or gluten free penne and enjoy! I love the look and sound of this. So simple but so tasty – what could be better! It look so tasty and I'll try it.How long could I keep the pesto? I used to buy red pepper/capsicum pesto at the grocery store. This recipe is exactly what I was looking for. I made it the other night, and the flavors were incredible! Thanks for sharing the recipe. I made this for the second time last night. So easy, fast and delicious! I used jarred roasted red peppers and we added some black olives and served with an arugula salad. Love your blog! I had the opportunity to visit Toronto this summer and enjoyed the city and food! Kaye: I am glad that you enjoy it and Toronto! Toronto has a pretty good food scene!